Pressure washing decks is the best way to clean a deck, but too much pressure and you can ruin good wood. At Spotless, we use a variable high pressure machine and we can control the pressure of the spray with different tips best suited for your deck’s needs, thus enabling a smooth, even finish with minimal splintering and NO GOUGING. We also offer deck stripping, in which a chemical process is used to remove hard embedded stains out of your wood. 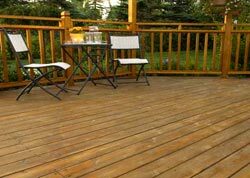 Deck sanding is sometimes also necessary, depending on the condition of your deck and the type of wood. Call Spotless for a professional and free evaluation.